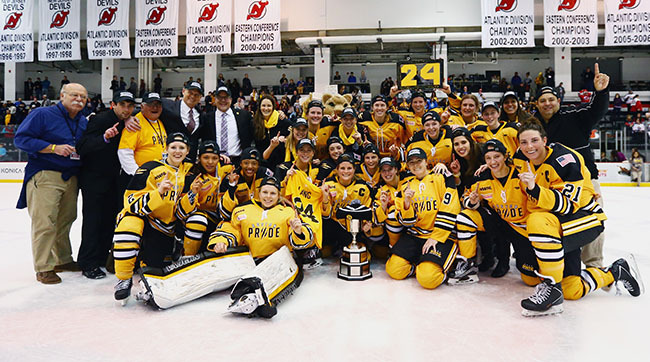 The four-team National Women’s Hockey League (NWHL) capped off its first season this weekend with a three-game championship series between the Boston Pride and Buffalo Beauts. On Friday, he Pride took Game 1 in overtime, 4-3, then defeated the Beauts again Saturday, 3-1, to sweep the series and claim the Isobel Cup. Boston was led by co-captains Hilary Knight and Brianna Decker, who combined for all three goals. Decker was named MVP of the series. Decker opened the scoring in the first period. Knight fed her a pass, which she blasted past Buffalo goalie Brianne McClaughlin. The score remained 1-0 until the third, when Decker beat McClaughlin a second time, this time shorthanded, thanks to another nice play from Knight. McClaughlin stopped Knight on a breakaway, but Knight collected the rebound and fed the puck to Decker, to buried it behind the Beauts goaltender. Knight finally found the back of the net less than two minutes later, extending the Pride’s lead to 3-0. Buffalo got on the board in the final minute on a goal by forward Erin Zach. But the comeback was too little too late against a Boston team that posted the best record in the league this season (14-3-1). "Today we lift the Cup as professional women's hockey players, something we always dreamed of,” Pride defender Gigi Martin said. ​One player who wasn’t on the ice with Boston was Denna Laing. Laing was suffered a severe spinal injury during the Outdoor Women’s Classic on December 31. But that didn’t keep her teammates from including her in the celebrations. The Pride held up Laing’s number 24, and defender Marissa Gedman FaceTimed with her during the on-ice party. 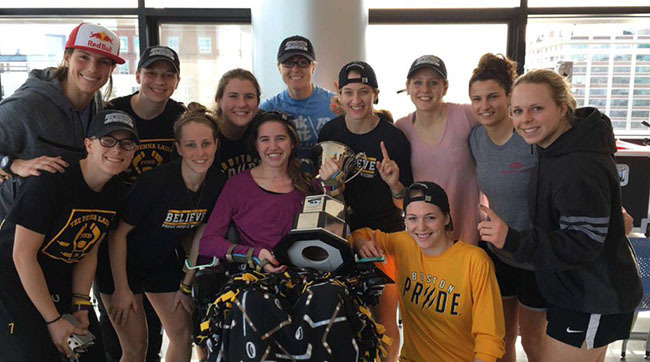 On Sunday, the Pride did bring the Isobel Cup to Laing — ensuring every member of the team was part of the championship moment. ​The NWHL championship trophy was named after Lady Isobel Gathorne-Hardy. She was the daughter of Lord Frederick Stanley. In 1893, she convinced her dad to donate a silver cup that would be awarded to Canada’s best amateur hockey team. That trophy is now known as the Stanley Cup. But Lady Isobel is recognized by the NWHL not because of her ties to Lord Stanley’s Cup — but because she was a pioneer of women’s hockey in Canada.